Celebrate the art of Japanese porcelain making through 15 generations of the Kakiemon dynasty. 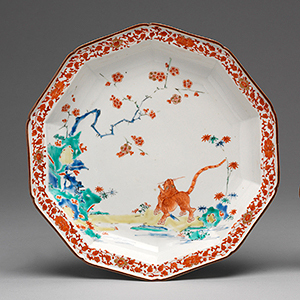 2016 marks the 400th anniversary of porcelain production in Japan. It is said to have started in 1616 in Arita, a town on the southern island of Kyushu near Nagasaki. One of the major styles of porcelain from Arita is known as Kakiemon. The Kakiemon style dates back to the 1670s and was made for a largely European market. It originated with Sakaida Kakiemon I, who learnt the secrets to overglaze enamelling possibly from a Chinese specialist in Nagasaki in 1647. He then introduced this technique to Arita, earning the name ‘Kakiemon’, which derives from kaki (persimmon) after the orange-red colour of the enamel.